Life Ring Holders & Ring Buoy Cabinets - Glasdon, Inc. Protect life preserver rings with Glasdon life ring cabinets. 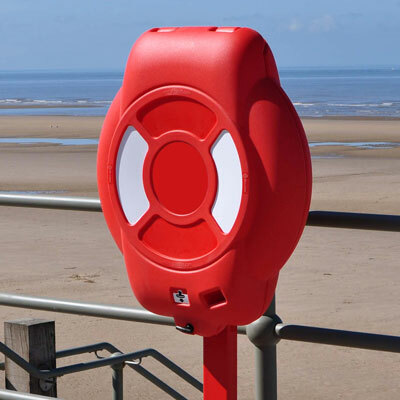 Highly visible and resilient for a long service life, Glasdon ring buoy stations prevent theft or vandalism and are easy to position in any area where open water poses a danger such as harbors, beaches, lakes, docks, marinas, swimming pools and water treatment plants. Manufactured from corrosion resistant Durapol™ material, Glasdon Guardian™ life ring cabinets are available for 24 inch and 30-inch life rings. You can be sure that these life ring cabinets have been rigorously tested to combine optimum performance with minimal maintenance, no matter the weather. The robust exterior is designed to withstand extreme temperatures, to protect the life-saving ring inside from harmful UV rays which can degrade the equipment. 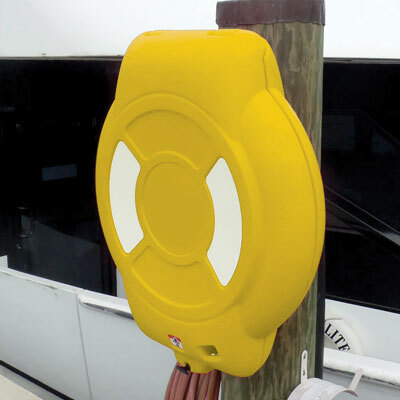 Glasdon life ring stations can be supplied with an optional USCG approved ring buoy as well as 100’ of rope. These life rings are inherently buoyant and capable of supporting weight in the water for extended periods. To help save valuable seconds in rescue attempts, the Guardian™ life ring cabinet also features a Ropemaster™ quick release system, allowing the equipment to be deployed in one swift movement with ease. Security seals and inspection indicators provide a deterrent against misuse, allowing for a quick and easy inspection of the life ring holder. Available in either a 24” or a 30” model to suit your needs, Guardian Life Ring Cabinets can be supplied with a variety of fixings for secure placement at any location. Unsure which model is best for your waterfront? View our helpful guide What size life ring do I need? to find the best solution for your requirements. Did you know? You can also personalize your Glasdon life ring cabinet to adapt it to your chosen location. Talk to us today.